The Crossing has a new website for marketing both the residential condos in the building named the Edgewater, as well as the adjacent commercial lots. I just wish they’d get the lingo correct. It’s ‘The Crossing’ (singular), not ‘The Crossings’ (some pages on the website) nor ‘Northfield Crossings’ (big yellow sign at the corner of 2nd St. and Hwy 3. Griff – Let’s not nit-pick the language. http://www.northfieldcrossing.com website has been up and running since August, 2009. Most of the places has it correct, but I found one place in the text and the tags at the bottom of each page where it was “crossings” rather than “crossing” – I am assuming the web page designer entered it incorrectly once, and then it was repeated that way throughout. 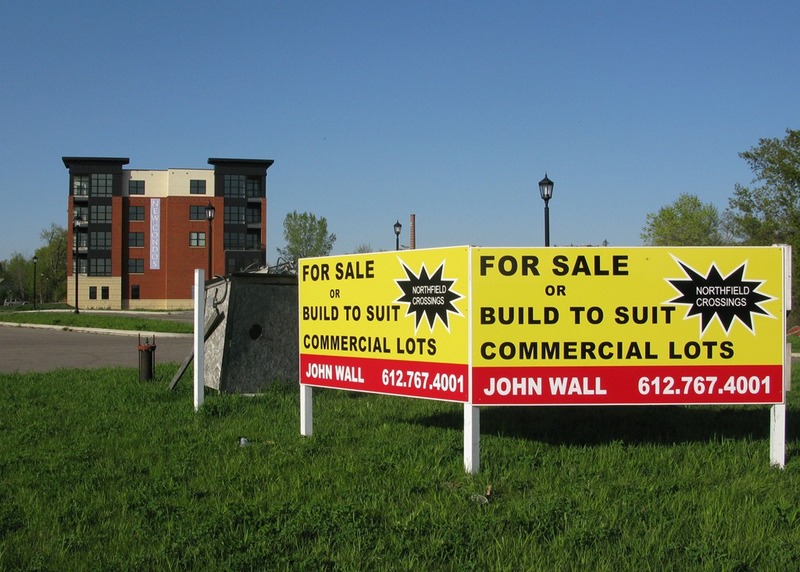 Again, with the sign for the Commercial Property, I suspect that someone without knowledge of the project entered the extra “s” while designing the sign – Our language set wants us to add the “s” when saying it. On a brighter note, watch for some landscaping improvements at the site as the summer moves forward. The City of Northfield and the owner banks of the property have been working on a plan that everyone can live with and it is hoped that the work can begin soon. Thanks for the update, Diane. Let us know when landscaping begins and let’s have some kind of celebration when it’s complete! But those “steps” and “short walk” won’t be taking place on sidewalks, since the sidewalks adjacent to the Edgewater were never connected to the downtown sidewalk network. Still reasonably walkable, but it seems like it would improve the appeal of those condos to add a few hundred feet of concrete.